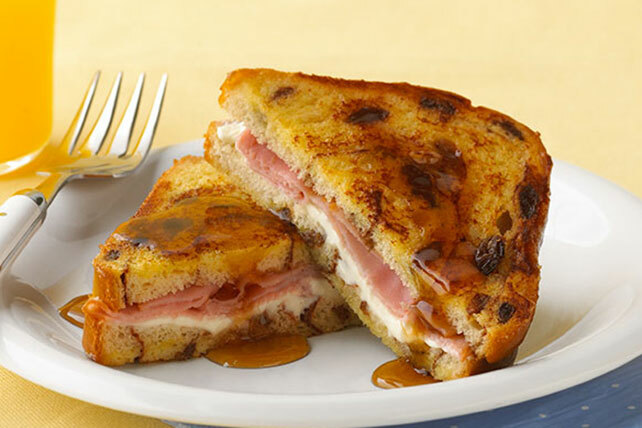 Get the best of both worlds with this Ham and Cheese Stuffed French Toast. This Ham and Cheese Stuffed French Toast is the perfect mix of sweet and savory. Add a fresh fruit salad to this dish for a delicious breakfast to start your day. Substitute OSCAR MAYER Deli Fresh Oven Roasted Turkey Breast for the ham. Prepare as directed, omitting ham. This recipe is as easy to make for a crowd as it is for 2. Simply increase the amounts of all the ingredients as needed, depending on how many people you want to serve. Prepare using 2 oz. softened PHILADELPHIA Neufchatel Cheese. If you love cinnamon, double the cinnamon hit by sprinkling the cream cheese with ground cinnamon.